Dial in warm and thick flanging for massive sonic swooshes. 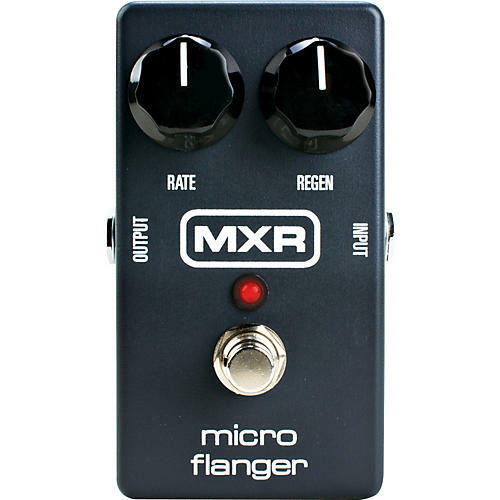 Based on the benchmark sounds of the MXR M117 Flanger, the MXR Micro Flanger guitar pedal features many of the same flanging effects of its big brother, but in a smaller and more convenient size. Originally released in the '80s, this faithful recreation features the same 2 critical controls-a Speed knob to control the rate of cycling, and a Regeneration knob to manage the overall intensity-and stays true to its 100% analog bucket brigade technology for the ultimate in warm and organic tone. The MXR Micro Flanger pedal has been updated with a true bypass switch so you don't lose any tone during bypass. Go from jet plane like sweeps to cool outer space type effects with the MXR Micro Flanger guitar effect pedal. The MXR Micro Flanger pedal can be powered by one 9V battery (accessed by removing the effect pedal's bottom plate), a Dunlop DC810DC brick, or MC403 Power system (sold separately).